If you have already tested negative for other bacterial infections such as Chlamydia and Gonorrhoea then this test may be appropriate for you. Also, if you have previously tested positive for Mycoplasma Genitalium and Ureaplasma Urealyticum/Parvum then this test would be appropriate for you. If you have not been tested for any infections but you are experiencing symptoms then we strongly recommend a Full STI Screen in order that the root cause can be identified. We send you a kit in the post and you provide a urine sample. This is sent back to our lab where it is tested for the Mycoplasma and Ureaplasma bacteria using PCR technology. PCR provides a highly accurate result as it looks for the DNA of these bacteria in the sample. As soon as we have your results for both of the tests, these will be posted in the secure area of our website which only you can access using your login and password. For reasons of security, we never send results by post or e-mail unless you specifically request us to do so. We are prepared to treat patients who test positive for Mycoplasma or Ureaplasma using an appropriate antibiotic if it is safe to do so. All medications are sent by overnight courier to ensure that you get started on your treatment as soon as possible. How quickly does all this happen? We will send the kit out to you as soon as you place your order. If the order is received before 5.00pm Monday to Friday then it will be sent that day and should arrive the next morning. 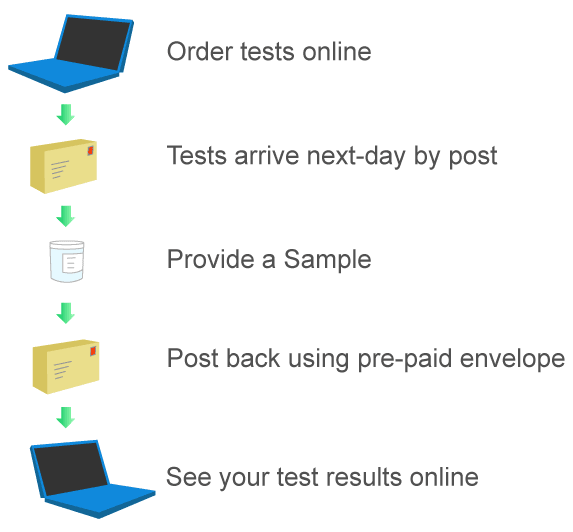 Most results are back within 36 hours of the sample being received. This test is laboratory-based and uses PCR technology, making it one of he most reliable tests available on the market. How long should I wait to be tested? It is unlikely that any bacteria will show up in a test less than 14 days from the point of infection so we recommend waiting around that length of time. If you are being re-tested after a positive result, then we recommend that you wait around 3 weeks after you were treated.